This chapter focuses on research methodologies, that is, an inquiry into research that experiments with the rhizome, an innovative way of doing childhoodnature research. 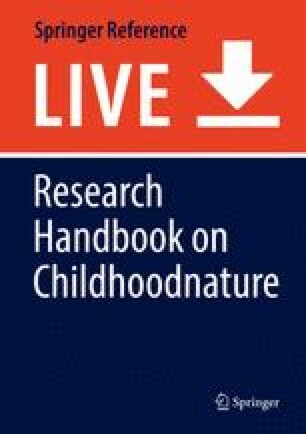 Educational studies in an Anthropocene era have often positioned “childhoodnature” research in the more familiar humanist perspective according prominence to the centered subject, representation, and interpretation. This approach to research has been the source of criticism for not responding to the challenges of the times. This chapter is situated within that critique by adopting a rhizomatic perspective to childhoodnature research informed by Deleuze and Guattari’s geophilosophy. Geophilosophy ruptures the received view of qualitative research and creates concepts in relation to the problem and questions that emerge from a research assemblage. A rupture also provides an opening for the conceptualization of childhoodnature as it emerges through the lens of rhizoanalysis and a theory on becoming that consists of reading the world and self. The chapter is a rhizome with multiple entries: situating the research assemblage and an ontology linked to geophilosophy. A presentation on the rhizome, rhizoanalysis, and the concept of assemblage follows. Then, they come together with Multiple Literacies Theory as contributing elements in reading a research assemblage. Next three rhizomatic studies constitute examples of research assemblages and how they might function. Finally, the intermezzo, the movement in between de- and reterritorialization according to Deleuze and Guattari’s geophilosophy, is one of becoming and establishes a movement for research yet-to-come. It provides potentially new directions for thinking about research as it unfolds with childhoodnature. Economist, The (2011). Welcome to the Anthropocene. http://www.economist.com/node/18744401.